A collection of short stories, mostly reinventions of fairy tales, by Yolen (Jewish Fairy Tale Feasts, 2017, etc. ), whose award-winning body of work stretches from sci-fi/fantasy to children's literature to poetry to cookbooks. 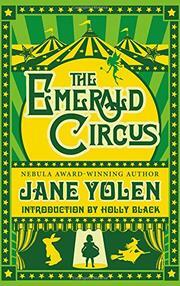 Yolen's collection gathers together one new story along with 15 previously published pieces, including the Nebula-winning novella Lost Girls, a feminist deconstruction of Peter Pan in which a pragmatic modern girl winds up stuck as a Wendy. But Neverland isn't the only imaginary land visited: “Blown Away” explores the acrobatic Dorothy, who returns to Kansas, and the reader visits Wonderland in both “Tough Alice” and “Rabbit Hole,” the latter a touching reflection on Alice's last trip. (There's also “Wonder Land,” the coming-of-age story of Alison, whose sacred mysteries are grounded in the real world.) Arthurian England hosts four stories, with Evian Steel, another novella, showing the forging of crucial bits of Arthurian lore. The real world (or something close to it) intrudes with the Nebula-winning “Sister Emily's Lightship,” best described as "Emily Dickinson meets a Martian," and the quirkily charming “The Jewel in the Toad Queen's Crown,” a musing on the unlikely, but perhaps magical, friendship between Queen Victoria and Benjamin Disraeli. Homages to O. Henry, Poe, the brothers Grimm, and Keats are also present. The strongest offerings dig fresh ground rather than riffing too closely on their source material: “A Knot of Toads” stands out as a creepy look at one's own assumptions and judgments. Though only one of the stories is new, true fans will delight in Yolen's notes and poems that follow the collection. An impressive overview of the author's breadth and career, this collection will appeal to the author's existing devotees—or to anyone who has ever thought that "happily ever after" left too many questions.